Get these great Civil War chess pieces to decorate your room and have a casual game with your friends. The American Civil War lasted from 1861 to 1865. In January 1861, seven Southern slave states individually declared their secession and formed the Confederate States of America and they attacked the U.S. fortress Fort Sumter. War broke out which remains the bloodiest in U.S. history. If you like American history or if you are a collector then a Civil War chess set might be the right set for you. These sets show historical figures of the American history and are solid and durable. There are various kinds of sets available. See examples below. 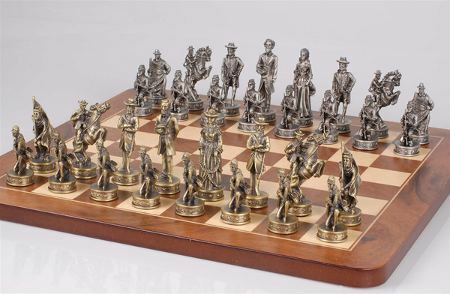 See this beautifully detailed Civil War chess set. These finely made chess pieces are made of poly-resin plastic. Each piece is hand-painted using long lasting, lead-free paint. These chess pieces are not recommended for children below 10 years of age since they will break if dropped or played with roughly. King size: 4 1/2" tall, 1-1/2" bases. Walnut root board with Pewter chessmen.